Armand Louis de Gontaut, duc de Lauzun and later duc de Biron, an officer in the American Revolution and and the French Revolution, was guillotined during the Paris Terror on this date in 1793. Born in 1747, Lauzun had some youthful finding-himself years “wasting his fortune in dissipation in various parts of Europe” before he got serious about being an Enlightenment Man, penned an essay on British colonial defenses, and went and fought them in a colonial skirmish. 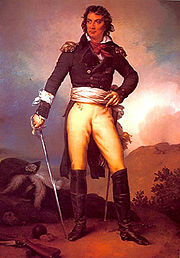 Satisfactory performance in West Africa qualified him to twist the lion’s tail again by raising a legion of hussars for the American Revolution. 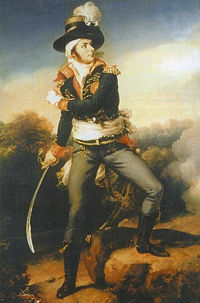 Lauzun fought at the independence-clinching upset of Yorktown, winning promotion back in the home country to marechal de camp. That Lafayette-like package of liberal sensibility, blue blood, and battlefield competence was just the thing for the more moderate early years of the French Revolution, and just the thing to cost his head by the time of the Terror. Our man found himself by 1793 transferred from the French army on the Rhine to the against War in the Vendee where he arrived already too milquetoast for the extreme violence being demanded for pacification. 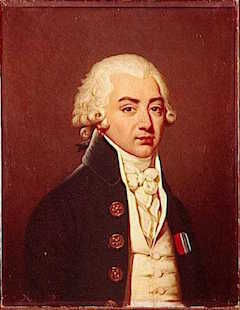 The Jacobin firebrand Marat had already petitioned for the ex-nobleman’s removal; it was effected by Jean-Baptiste Carrier who in 1793 was busily blackening his name by pacifying the Vendee with indiscriminate slaughter. On this date in 1794, one of the great royalist generals of the Vendee revolt was shot by the French Revolution’s Republican forces at Nourmoutier. The 1793 counterrevolutionary uprising in the Vendee had roused retired cavalryman Maurice Joseph Louis Gigost d’Elbee (English Wikipedia link | French), and he became the second commander of the Royal and Catholic Army upon the death of Jacques Cathelineau. 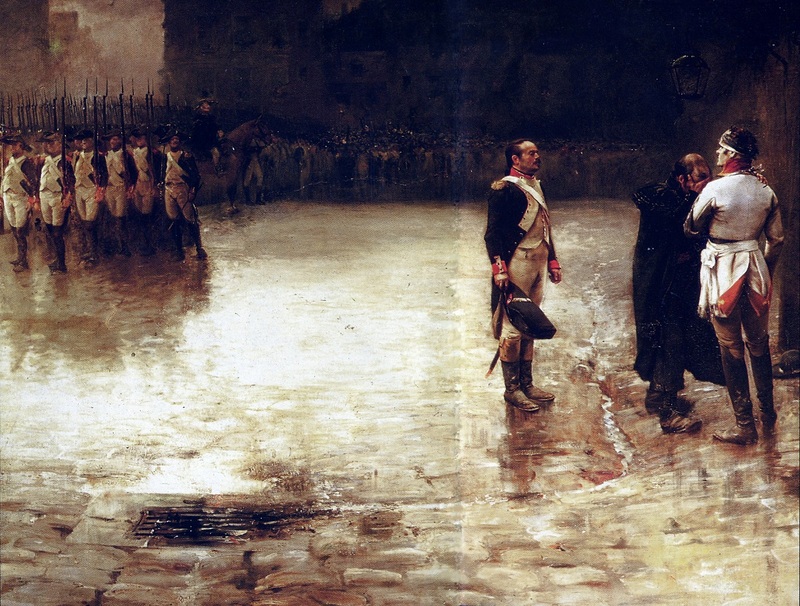 Unfortunately for d’Elbee, even with English support, the balance of force rather tipped in favor of Paris, and the Revolutionary government was obviously not shy about sealing its victories in blood. 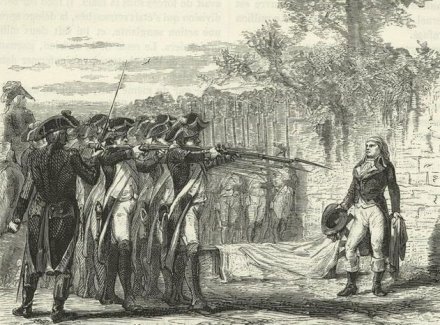 D’Elbee suffered a grievous wound at the Battle of Cholet in October 1793, and for a couple of months was spirited one step ahead of the advancing Republicans. As Charles MacFarlane writes in The French Revolution, Vol. 3, he ran out of room to run at the island of Noirmoutier. D’Elbee was lying in bed between life and death; his wife might have escaped, but would not leave him: they were both taken. 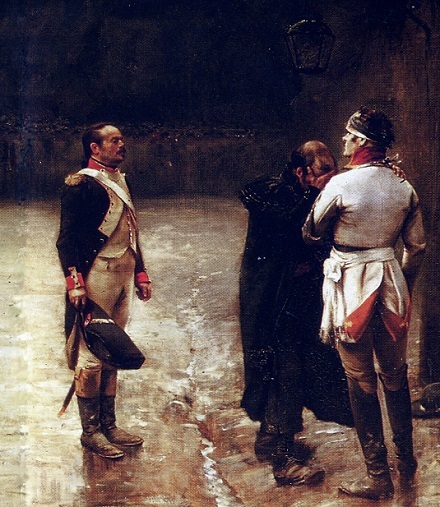 As Turreau’s soldiers entered their chamber the wounded royalist exclaimed, “Yes, here I am! Here is d’Elbee, your greatest enemy! If I had been strong enough to fight or stand upon my feet, you would not have taken me in my bed!” They kept him for five days, treating him with execrable barbarity, and then carried him in an arm-chair to the place appointed for fusilading the prisoners, and there shot him. His wife was fusiladed the next day, and her brother and brother-in-law perished in the same manner. 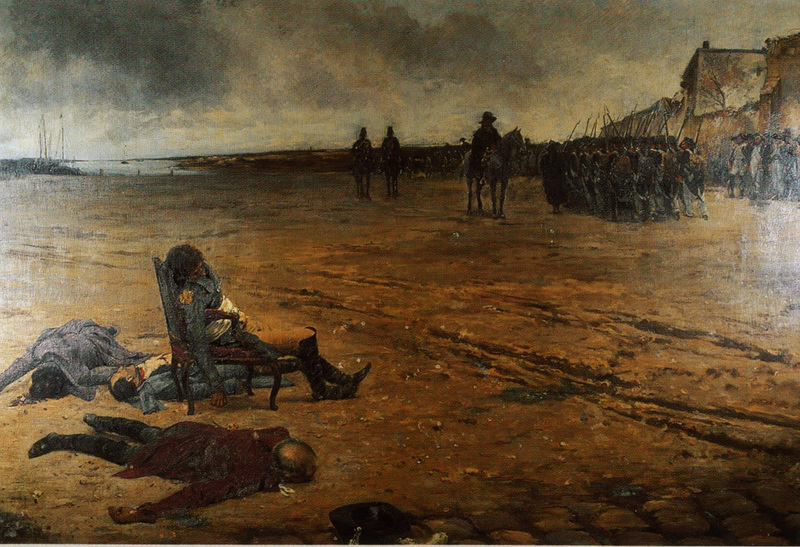 Mort du General d’Elbee, by Julien Le Blant, depicts the general shot with three other royalist officers. Not pictured: Hundreds of other Vendean prisoners massacred in the aftermath of the Battle of Savenay.